Yandoit is a rural village 17 km north-west of Daylesford and 110 km north-west of Melbourne. It is thought that the name is derived from an Aboriginal word meaning travel. Gold was discovered in a gully about 2 km north-west of Yandoit in 1854. During the following year farm allotments in and north of Yandoit were offered for sale. Miners and settlers included Germans, British and Italian, and the influence of the Italian community continues to be evident in the style of some farm buildings. The Gervasoni family came to Yandoit in 1859-60, and the ruin of their large homestead is on the Victorian Heritage Register. A school was opened in 1861. 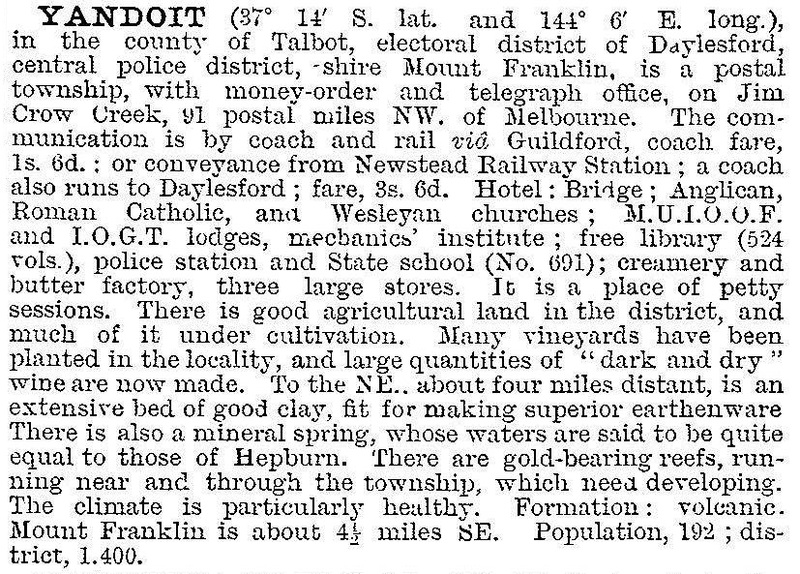 Within a few years Bailliere's Victorian gazetteer (1865) recorded that Yandoit had four hotels, agricultural and mining activity and an estimated population of 950 persons. Mining continued until the outbreak of World War I.
Yandoit is a minor centre for a farming district not touched by major roads. Its primary school continues (20 pupils, 2014) along with Anglican and Catholic churches (1884), a mechanics' institute hall (also 1884) and a tennis court. Both the Anglican church and the mechanics' institute were badly damaged by fire in 1969 and were extensively repaired. The Yandoit mineral spring is north-east of the village, near Clydesdale and the Jim Crow Creek. There are several stone buildings, some of Italian origin, to be seen, and a vernacular slab and weatherboard house named McKinnons Cottage dates from the late 1840s. It is on the Victorian Heritage Register. The New Nuggetty Gully alluvial gold workings and a fossil quarry are also on the Register. The Yandoit, Franklinford and Clydesdale Community Action Plan (2008) was reviewed in 2013 and initiatives included improved recreation areas, tennis, walking and communication facilities.